I'm Mijanou ter Braak, this is my art and music. I hope you will enjoy what you see and hear. My subjects are love and hate, fear and anger, war and life. Drawing these works gives me a total feeling of being alive. I hope you enjoy looking at them as much as I enjoyed making them! I started painting with oil paint in 1984. It was my choise then to become a fine artist. That is what I loved to do, and still love to do. Beside my own personal works I painted portraits for many years. I also painted landscapes and animals. I'm Mijanou, and I'm Dutch/English. I'm born in Geldrop, Holland 1969. After a very disappointing experience with two Belgium art colleges, I moved to London in 1986, were I lived for several years as a street musician. 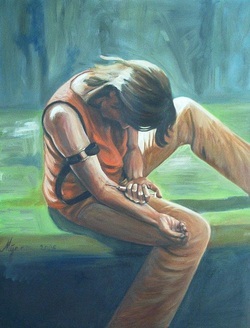 My work has developed over the years from fantasy to realistic society paintings and drawings. I have always aimed to develop myself as an artist over the years. Working as a portrait painter, life drawing and painting classes have surely improved my skills to enable myself to try to come as close as possible to what I want to show people. You could call it Society & Fantasy art. Of course I will always try to get better, more detailed and more obvious, for I believe a human being will develop him/herself until the end. It is what i call the process of life. Seeking for the answers to our questions, looking for the connection between people, observing our surroundings and learning from it continuously. My work is difficult to categorize. You can find many influences out of different art movements in it. My ambition lays in the message and atmosphere that lays within these works. A work has to speak on its own. With only a few words, its meaning should be clear. That is the goal I wants to achieve. My main theme has usually a social and emotional meaning. With these works I wants to show my view on society, and make people think about this society. Under the name Anna Brag I am a performing singer-songwriter. I'm trying to express a deep emotional feeling in my singing and lyrics. I linked my music sites to this site so please feel free to listen & enjoy! Mijn werk is moeilijk in een bepaalde categorie onder te brengen. Er zijn veel invloeden uit verschilende kunststromingen in terug te vinden. Mijn ambitie ligt dan ook in de boodschap en atmosfeer die de werken uitstralen. Een werk moet spreken uit zichzelf. Met slechts enkele woorden moet zijn betekenis duidelijk worden. Dat is het doel dat ik bereiken wil. Mijn hoofdthema heeft meestal een sociaal emotionele inhoud. Met deze werken wil ik mijn kijk op de maatschappij duidelijk maken, en mensen over deze maatschappij laten nadenken.